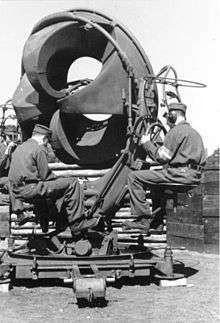 Hitler Youth operating an acoustic locator in early 1943. A Luftwaffenhelfer, also commonly known as a Flakhelfer was, strictly speaking, any member of the auxiliary staff of the German Luftwaffe during World War II. Such terms often implied students drafted (conscripted) as child soldiers. With a literal translation of "air force assistants", Luftwaffenhelfer (masculine plural) and Luftwaffenhelferinnen (feminine plural) came into being on January 22, 1943, following implementation of the decree Kriegshilfseinsatz der Jugend bei der Luftwaffe ("Youth War Assistance Service in the Air Force"). The order called for drafting whole school classes with male students born in 1926 and 1927 into a military corps, supervised by Hitler Youth and Luftwaffe personnel. The draft was later extended to include the 1928 and 1929 births. Deployment included ideological indoctrination by the Hitler Youth, military duties and limited continuation of the normal school curriculum, often by the original teachers. While the official term was "Luftwaffenhelfer (HJ)", the term more commonly used is "Flakhelfer" ("Flak-assistant"). The 1926–1929 births are commonly referred to as the "Flakhelfer-Generation". In German ears the phrase associates with the collective and incisive experience of being torn out of conventional adolescent life (though under circumstances of total war) and being thrown into strict military service and extreme peril, when in the final phase of the war, the AA-batteries themselves became preferred targets of allied strafers. 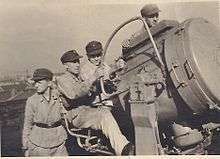 In August 1944 some 660,000 regular male soldiers and 450,000 female helpers (anti-aircraft personnel) in all departments served with the Luftwaffe within the 'auxiliary antiaircraft defense'. Many of the girls came from the Bund Deutscher Mädel (BDM), although they had to officially join the Wehrmacht, because it was forbidden for BDM-girls to do armed duty. In 1945, "Flakhelferinnen" and other female subsidiaries were trained and allowed to carry weapons to protect themselves. On April 1944 the Germans had requested the drafting of 7000 Latvian boys, aged 14–16, and 400 girls, all for service as Air Defense auxiliaries. However, the Self-Administration of Latvia refused and consented only to invite the youths to volunteer. As the situation at the Eastern Front worsened, in June and July the Self-Administration did agree to draft boys born in 1927 and 1928. From July 28 to September 9, 4139 boys were drafted, 525 of whom were volunteers. Hermann Frech (Author), On the Way to Siberia (Kindle Edition) Germany 1944: Hermann Frech is not yet sixteen years old when he is conscripted for military duty – at an anti-aircraft battery. His duty is supposed to keep him in comparative safety near his home, but as the Third Reich collapses around him, his duty orders take him far away. Forced to become a "child-soldier," he huddles in the Reichstag in Berlin as the Soviet Red Army makes its final assault on the capital. Taken prisoner, his life is a daily struggle to find scraps of food to eat and avoid being killed. When he thinks that life could not get any worse, the Soviets tell him that he is destined for Siberia! Hermann Frech’s compelling account helps the reader to feel the pain and dilemma he faces. This is not a story about heroes or the rights and wrongs of war; it is a story about a captured young man’s struggle to survive and return home to his family, and how, throughout the ordeal, his spiritual faith helps him cope and is strengthened by the experience. On December 6, 2011, Hermann Frech was awarded the Medal of Merit of the German Federal State of Rhineland-Palatinate. ↑ Mangulis, V. Latvia in the Wars of the 20th Century. CHAPTER IX JULY 1941 TO MAY 8, 1945. Historia.lv. ↑ Youth at War: Feldpost Letters of a German Boy to His Parents, 1943-1945 is a bilingual (German and English), annotated edition of a large collection of Feldpost letters and postcards written by a German boy between September 1943 and February 1945. Born in 1927, Gerhard G. was one of Germany's youngest soldiers during the Second World War. He was only fifteen years old when in September 1943 he became a student (Luftwaffenhelfer) in the German Flak, an anti-aircraft gun unit that defended Germany against frequent aerial attacks by the Allied Forces. In July 1944, he was drafted into the RAD (Reichsarbeitsdienst) , a compulsory national labor service for young men and women. Finally, in October 1944, Gerhard joined the German navy (Kriegsmarine), where he served on the pocket battleship Admiral Scheer from January to March 1945. In May 1945, at the age of seventeen, he became an American prisoner of war. Due to his young age, he was released and permitted to return home in August 1945. This collection of one hundred and forty letters and postcards he had mailed to his parents was found in his house, shortly before his death in May 2008, neatly tied together by a string and in chronological order. It represents the large majority, if not all of the correspondence to his family that reached them while he was away from home. Gerhard's letters give deep insight into many aspects of military and social life during the Second World War, while offering the reader a rare and close look at the war experiences, thoughts, and feelings of an intelligent German boy who, from one day to the next, was made a part of Hitlers war machine. In combination with photographs and other documents from his childhood, youth, and young adulthood, these letters help reconstruct an interesting piece of German Alltagsgeschichte and can perhaps shed new light on a much-discussed time in German history. The edition, which includes a historical and biographical introduction, is not only a valuable source for scholars and students in various disciplines, but also addresses general readers with an interest in the social history of the Second World War. ↑ Flakhelfer to Grenadier. Memoir of a Boy Soldier, 1943-1945. (Foreword by John M. Janzen) On January 7, 1943, the German Government, in order to free adult soldiers for frontline duties, ordered that all male students of elite secondary schools (Gymnasium, Oberrealschule) born in 1926 and 1927 were to be drafted into anti-aircraft service in the Vaterland. The day the young boys were ordered to arrive in the designated batteries was February 15, 1943. The official term for them was Luftwaffenhelfer (Air Force Auxiliary), although they were usually, and more accurately, called Flakhelfer (Anti-Aircraft Auxiliary). After serving from one year (those born in 1926) to eighteen months (those born in 1927), the boys were transferred into the Reichsarbeitsdienst (Reich Labor Service) and from there into the Armed Forces. They were replaced by boys born in 1928. A total of about 200,000 boys served as Flakhelfer. Their average age when they were called up was sixteen, but due to the birth date quite a few were still fifteen (as was the author). The boys served in batteries of Light Flak (2 cm and 3,7 cm guns) and Heavy Flak (8,8 cm, 10,5 cm and 12,8 cm guns). The author served as Flakhelfer in the regions that suffered the most numerous and heaviest air raids of the war, in the Rhineland (Düsseldorf) and the Ruhr (Recklinghausen). After fifteen months as Flakhelfer he was transferred first into the Reichsarbeitsdienst, then into the Army. The memoir covers the time period from June 10, 1943, to September 23, 1945. The memoir was written based on the author's diary notes of that period. Little, if anything included here, is made use of from post-war sources. Views, opinions and interpretations of events expressed in the memoir are those from inside Germany at the time. They may be inconvenient today but mirror the chaos of the time and place. Then, to live or not to live was accidental. The German American author, with a long professional career in the U.S. and Germany, has published seven books and numerous articles in scholarly journals. He wrote this book as an old man, giving a voice to the silent, forgotten generation of those born in Germany in 1926 and 1927.